This summer, the familiar oval parking lot in front of the Art Museum will become Philadelphia’s ““new shape of fun.” Philadelphia Parks and Recreation (PP&R) is recreating Eakins Oval with the help of the Fairmount Park Conservancy, the William Penn Foundation and the City of Philadelphia. “The Oval” is going to be home to community programing and activities for all ages throughout the rest of the summer. Mural Arts will paint over the entire lot and PP&R will construct Philadelphia’s very own boardwalk – complete with a sand beach. 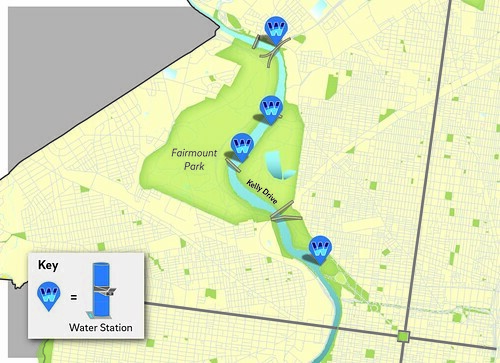 The Fairmount Water Works Interpretive Center will provide tours and hands on education about Philadelphia's water. The pop-up park will open July 17th through August 18th, Tuesday to Sunday, 9 a.m. to 9 p.m. Each day will have specific free programming (see below), but you can expect interactive games, education and environmental programs, live entertainment, movies and food trucks on a daily basis. To learn more about this new initiative, visit Phila.gov or call 215-683-3600. You can also find The Oval on Facebook and on Twitter @TheOvalPHL!